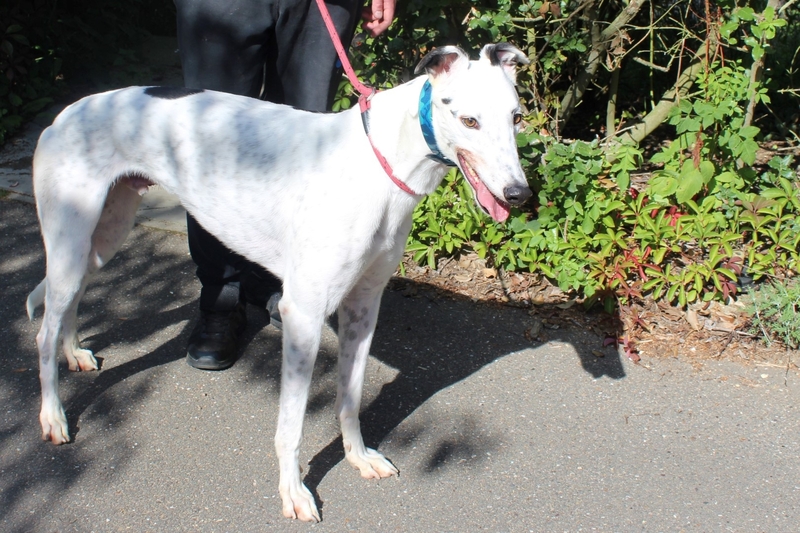 Born in April 2016 Blink (Racing name Droopy’s Blink) is a super young man with a rather striking white coat. He is settling in well at kennels and is currently sharing his kennel with a girl. Update 02/1/18 Blink had an outing with his friend Dart today. He was taken to visit some other breeds of dogs at a Doggy Day Care centre. He didn’t know what to make of them, all different shapes and sizes he had no idea that not all dogs were greyhounds. He will be going again next week and hopes to be able to go for a walk with one of them. Update 18/02/19 Blink had a nice surprise today when he was taken to Alton Water. He became good friends with Fox and behaved well when he walked past other breeds of dogs, he is really starting to get the hang of them now. We just need to do a little more work on his dog manners because he thinks everybody is as pleased to see him as we are. Sadly that’s not always the case Blinky you big soft playful and lovable boy.